Kathy grew up in Botkins, Ohio. She got her start in the optical business as a receptionist for 20/20 Vision Center in 1985. After a two year apprenticeship, she obtained her Optician’s License in 1987. Since then, Kathy has gained experience in many aspects of the optical industry, ranging from optician, to office manager, to optical lab rep.
Kathy moved to California in 1993 where she managed the optical shop at Edwards Air Force Base. In 1997, she moved back to Ohio and managed Northwest Optical for 10 years. After this position, she spent several years as an outside sales rep for Hoya Vision in the Cincinnati area. 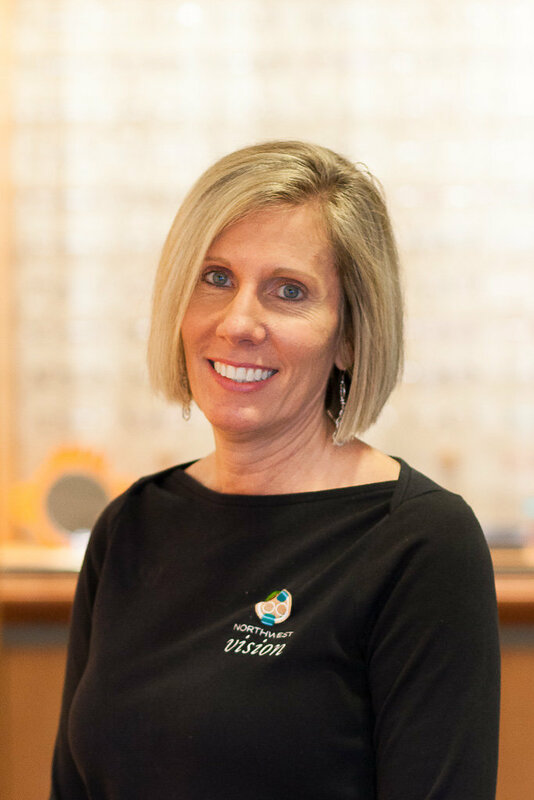 Kathy then moved back to the Columbus area and started her career at Northwest Vision Center in September of 2016. Kathy is married to her husband Jim and has three children; Brad, Craig, and Chloe. She also has one granddaughter Kyla. In her spare time, Kathy enjoys crafting with her sisters, taking care of her two dogs, Max and Maggie, and spending as much time as possible with her granddaughter.